If you have access to this mixer during off hours, I suggest you spend some quality time with a pair of headphones and some recorded tracks. Put your cans on and twist some knobs. If you really want to understand how something works, experiment with it when you have nothing to lose. Twist that attack knob all the way, in both directions. See what it does. Change the rato from 2:1 to vice grips and listen to what it does to the sound. Experiment until you get it, then employ your new found knowledge. I spent a month in my office with headphones on when I got my first digital mixer. I downloaded dozens of multi track recordings and practiced mixing them. I tried every effect available. Twisted every knob and punched every button until I knew what they all did. I suggest you do the same if you have the opportunity. Ok, this past weekend was our first services with the wireless receivers switched to "mic" (as they should be) instead of "line". Everything went well on the vocalists. We adjusted gain and then the faders as needed. No problems at all. But the preacher mic.....sigh....he was still peaking. So I back the gain on the receiver to roughly -10. Still peaking. So lowered the gain on the mixer. But then I was losing volume, so I increased the fader. Still peaking (a little). Although I must say, the red peak light on the actual channel strip blinks sometimes. But if I PFL the channel and look at the meter at the top of the board, it's not always in the red. Is this common. I'm guessing the light on the channel is a bit sensitive?? Anyways, I don't know what to do. If I lower the gain on the board any more, I will be pushing the fader all the way to the top. But let me note this: Our master fader is not a unity. And I think it should be (or close). And here's why it's not: When we did our first initial sound check, the master fader was at zero. But after the first Sunday morning with our new sound system, we were getting complaints of it being too loud. So, we lowered the master fader. And it's just been that way ever since. But let me note this: Our master fader is not a unity. And I think it should be (or close). The little red light flashing means you are still feeding to much level into the channel. The light is faster than the vu meters, and is correct in flashing when overdriving the pre amp, so TURN IT DOWN! Push up the channel fader and/or master if you loose to much level. They are intended for that. Don't look at the position they are in. LISTEN! As suggested before: learn how to use a compressor. Push the master back up, then turn down all of the channels. Turn the gain down more on any channel that is clipping, then push that fader up to get the required volume. It all depends on how much you pulled down your master fader. If it's too low your gain staging is wrong and you are losing headroom. I think you are way too caught up in the lights and not how it sounds. If you are just getting a little tickling of the light on the channel strip and there is no audible distortion then how does the mix sound? Remind me what kind of board this is again? May I start by asking how the gain was determined for the preachers mic. Where were you in terms of metering on his mic receiver. As I don't belive you were peaking/clipping or probably even near the red at the receiver best practice suggests you could reset the gain there to 0. And lower the gain on the Qu until the light stops flashing. The peaking led of the Qu lights up at -3dBFS. Honestly if it lights up but sound good(no distortion) and you are happy with the sound you are getting you're fine. This is to say that the light flashing briefly isn't the end of the world. Now your real problem on that channel is the amount of dynamic range of the signal going through. Which is the difference between the softest and the loudest parts of the signal. The difference between your average and loudest level is higher than you want it to be. As has been said before compression is your solution here. Bare with me here I'll come back to this I need to make sure you understand the next part first. 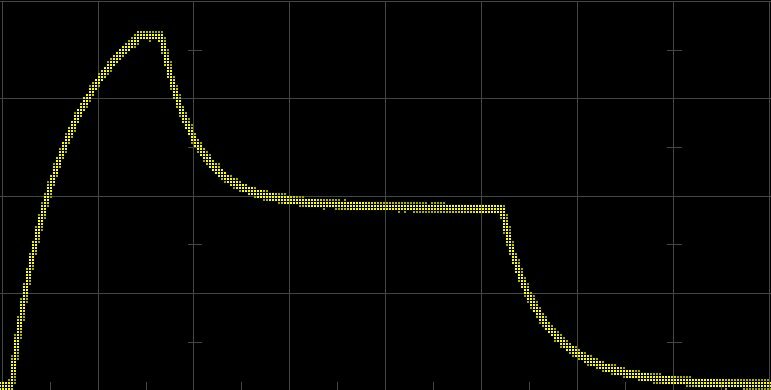 If you were to make a graph of your signal level with time on the horizontal scale and level on the vertical it would look like this. Actually that is exactly what it is but for a very small slice of time. That doesn't matter in this example though. This is why your meter isn't constantly in the red. It shows instantaneous level. Back to the first point... The part where the line in the graph is horizontal represents the average level when your preacher is speaking normally. The peak that you see before that is the moment he is speaking loudly and this is what your peak light is responding to. Activating a compressor will push down on the top of your peak pushing it closer to the average. Unlike the gain knob it only affects the loud parts. The advantage you have now is that you can raise your total level more before it peaks and have a more constant level over time. How much have you dropped your master fader in dB. Theoretically you could drop the level at the amplifier that same amount. In practice though half that value is probably enough unless you dropped it more than 20dB or something. Seriously though skipping some of the steps provided here will lead to some/lots of disappointments. QU input pads are only available on inputs coming from a stage box not on the surface inputs. Apologies to all for bumping this old thread but I finally remembered to check a QU24 last night and can indeed confirm that Mike is correct. Input pads are only available for inputs coming from a digital stage box. I guess we've been using the stage box so long now that I forgot they were not available previously. Mea culpa -- just wanted to correct the record for anyone referencing this thread in the future. Sorry to keep this one going, but wanted to let everyone know that we are no longer peaking on our preacher channel. We finally got our master level up to unity. Between that, and switching the mic receiver(s) to mic instead of line, and adjusting the gain on the receiver(s), we have the situation under control. Now onto the next issue. haha. Seems like it's always something. It's like owning a house. No matter how long you live there, you have some project going on. But I enjoy it. Thanks for all of your input and help.